Some things are worth waiting for. 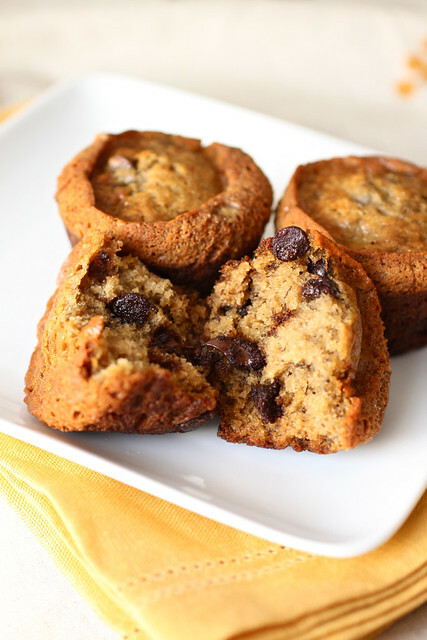 Like these banana espresso chocolate chip muffins. Perfect banana flavor balanced with semi-sweet chocolate chips that are totally enhanced by some instant espresso powder. Love, I tell you, love. My interest was piqued months ago while tagging recipes to make in the Baked cookbook and then my interest took off after both The Pêche and Smith Bites blogs, my fellow Big Summer Potluckers, were gushing about these muffins on Twitter. For whatever reason, the recipe got pushed down “the list” and I finally just took a few well-ripened bananas out of the freezer this week, only intending on using them in this recipe. And boy, I can see what they were gushing about months ago! These muffins are hands-down some of the best I’ve ever eaten! I love the fact that they were so quickly whipped up (not literally) by hand rather than having to pull out the stand mixer…and I love the fact that even though I forgot to add the milk until after I mixed in the chocolate chips at the end, the muffins still turned out amazing! They bake up with this funny shape, only what I picture to be a quintessentially quirky Baked trademark look, and when fresh out of the oven, the chips are gooey, the banana is prominent, and there is a slightest hint of crispiness around the top edges. Love, I tell you, love. I figured out after making these muffins a number of times that the funny shape of them is due to extra liquid in the batter from the bananas. If you want nice and neatly domed muffins, drain off the banana liquid before mixing in the other wet ingredients. I love the look and the extra flavor the liquid lends to the muffins so I just leave the liquid. Preheat the oven to 350° F. Spray a 12-cup muffin pan with nonstick cooking spray. In a medium bowl, stir together the bananas, sugars, butter, milk, and egg. In another medium bowl, whisk together the flour, instant espresso powder, baking soda and salt. Make a well in the middle of the dry ingredients. Pour the wet ingredients into the well and stir just until combined. Fold in the chocolate chips. Fill each cup about three-quarters full. Bake in the center of the oven for 20-25 minutes, until a toothpick inserted in the center of the muffin comes out clean. Move the muffin pan to a cooling rack, and let cool for 15 minutes. After 15 minutes, remove the muffins from the pan and let them finish cooling on the cooling rack. Muffins can be stored in an airtight container for up to 2 days. Banana and coffee always go so well together, and obviously chocolate too. These sound like a perfect morning treat! This looks great. I love that you added coffee. I just bookmarked this recipe in my Baked cookbook! They sound delicious and now that I know they’ve had rave reviews all around I’ll have to make them even sooner than I anticipated! I have had my eye on these for some time now, but to actually see them made has got me totally ready to make em 🙂 YUM!! Banana, chocolate, and coffee!! I love all these flavors put together – beautiful! I have some old bananas, I think I will make this tonight. Thanks for the recipe. Mmmm…that looks so good….bananas and chocolate…a perfect match. I LOVED these Banana Espresso Chocoloate Chip Muffins too! I think that they have the weird shape because you need to drain the bananas of the liquid after defrosting them. Mine came out just perfectly shaped when I used fresh bananas. I didn’t have enough bananas so I added fresh chopped mangoes from a friend’s tree in their backyard (in Hawaii 🙂 ). You could also try substituting some chopped apples for some of the bananas. I also didn’t have any espresso powder, so I substituted instant decafe coffee powder….delicious! I made these yesterday! The best muffins I’ve ever made, and ever tasted! A must try!